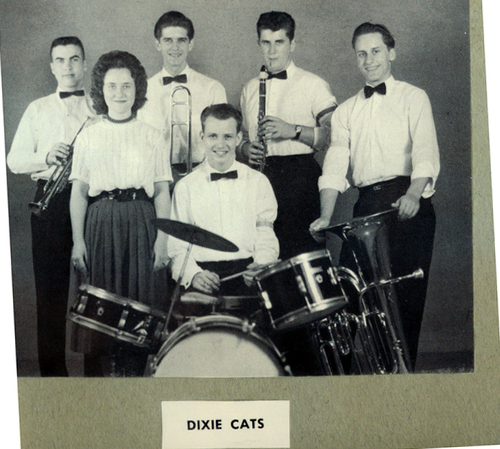 Charles writes of the second photo he sent today, "The second photo is of the 'Dixie Cats', a somewhat non-famous group of Dixieland players. Front row L-R: Billie Jean Trombatore and Carey Murphy. Second Row L-R: Ken Watts, Charles Simmons, John Hammerle, and Charles Ferguson." I remember that they performed at a number of school programs and shows, probably in the 1960 Carat show as well. Wouldn't we love to hear these cats jammin' today? Surely they still have the talent and have maintained the lip, wind, and stamina to perform!!! Maybe they'll grace us with a few numbers at the 50th reunion celebration!